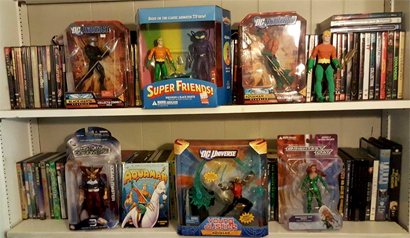 We haven't run pics of a F.O.A.M.er's personal AquaShrine in a while, so here is the collection of member Mark Belkin (click to embiggen). As you can see, all the members of the Aqua-Family (good and bad) are represented! Mark writes for the DC in the 80s blog, where he just recently interviewed former Aqua-writer J.M. DeMatteis, go check it out! Thanks Mark!